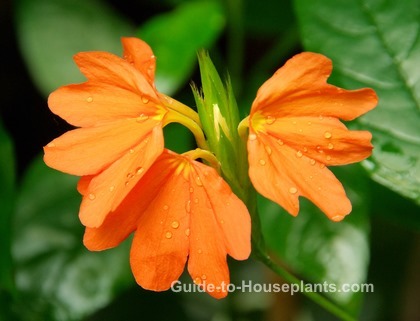 Firecracker flower makes a stunning house plant that blooms dependably from spring through fall. Orange flowers are most common, but other colors include red, yellow and pink. The flowers are held upright from green tubular bracts. Even young plants are eager to bloom, sending up clusters of flowers most of the year. Flower colors are available in orange, yellow, pink and red. 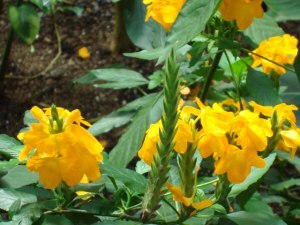 'Mona Wallhead' has salmon pink flowers...'Lutea' has golden yellow flowers. Its deeply veined, glossy leaves grow in opposite pairs, growing up to 5 in (13 cm) long. In its native tropical habitat, this firecracker plant flourishes in the year-round warm temperatures and high humidity. Dropped leaves are sometimes a symptom of being exposed to cold air. 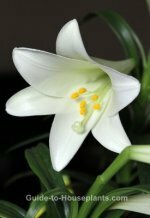 Keep this flowering plant away from windows, doors or A/C vents, where it may be exposed to blasts of cold air. If the leaf tips turn brown, raise the humidity around it. Crossandra infundibuliformis is in the Acanthaceae family. This attractive clan boasts more than 2,000 species. Many are popular house plants, including Zebra Plant, Polka Dot Plant and Persian Shield. What many of them have in common is a brightly colored flower spike. Others have showy foliage. Some have both. Repot in spring. Keep this flowering plant in a small pot because it blooms best when its roots are crowded. Use a pot with a drainage hole to prevent soggy soil. Watch for spider mites that like dry conditions. Raising the humidity around the plant discourages these pests from invading. Firecracker Flowers make a beautiful addition to a group of other tropical plants. Bringing them together as a group helps to raise the humidity around them. Light: Bright light. Some direct morning sun is fine, but keep shaded from hot midday sunlight. Plants that don't bloom aren't getting enough light. Move the plant to a brighter location where it will get filtered sunlight. Water: Water thoroughly, allowing the top 1 in (2.5 cm) of soil to dry out between waterings. Don't allow the soil to get soggy because it will quickly kill the plant. Water less in winter, while plant is not actively growing. Remember to always use room-temperature water to water your tropical house plants; cold water shocks them. Humidity: Moderate to high (around 50% relative humidity or above). Using a cool-mist room humidifier is the most effective way to increase moisture in the air. Temperature: Average room temperatures 65-75°F/18-24°C year-round. Propagation: Take 3 in (7.5 cm) stem tip cuttings in spring and pot them separately.